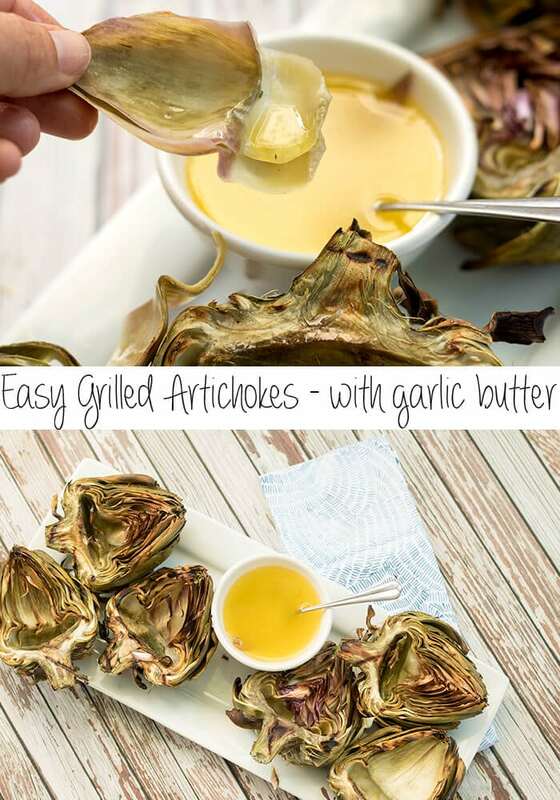 This post will show you how to grill artichokes. 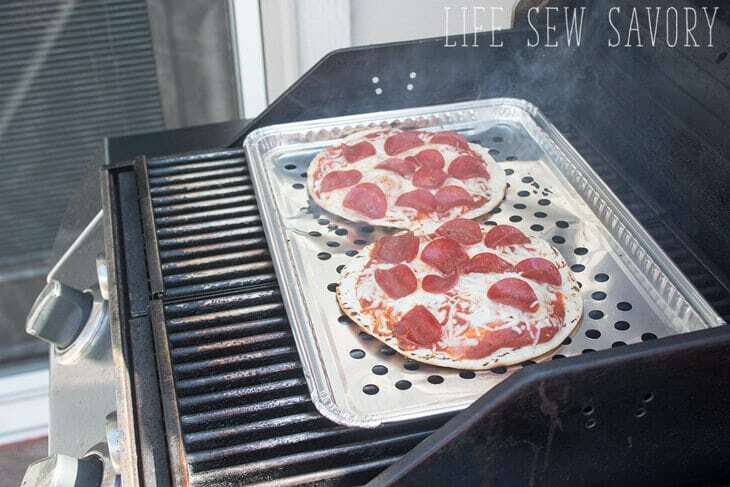 This summer is our first with a real grill and deck and I’ve been grilling all the things! I recently introduced my family to grilled artichokes. 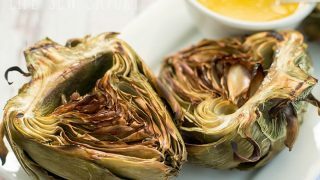 Anything is good when dipped in garlic butter, but the amazing flavor of grilled artichoke is a great addition to any meal. The printable recipe card is near the bottom. We’ve been trying not to turn on the air-con this summer so grilled meals are my first choice for cooking. 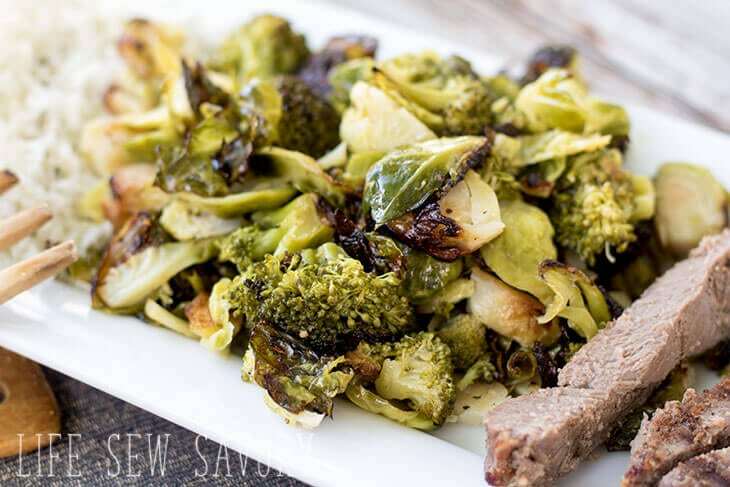 We’ve been experimenting with grilled meats and veggies all summer long and now I have a few favorites to share. 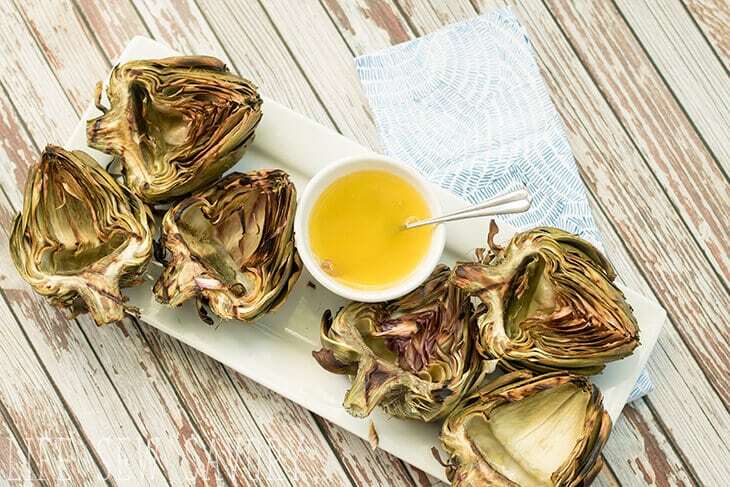 These grilled artichokes are a new favorite for sure. Ok! 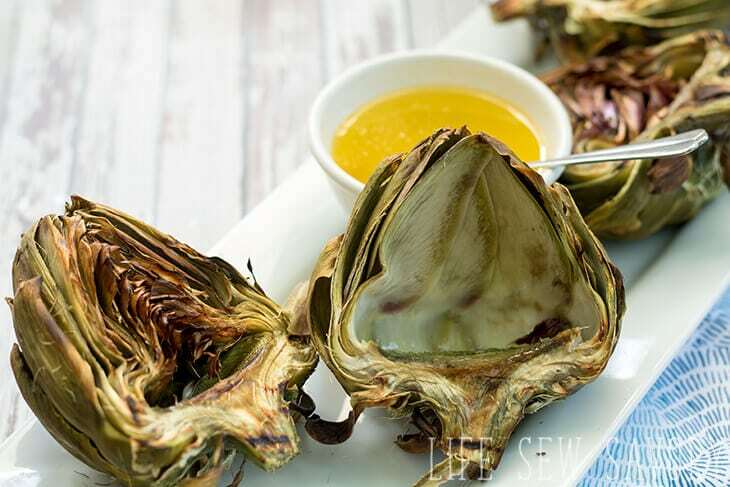 Let’s show you how to make grilled artichokes! 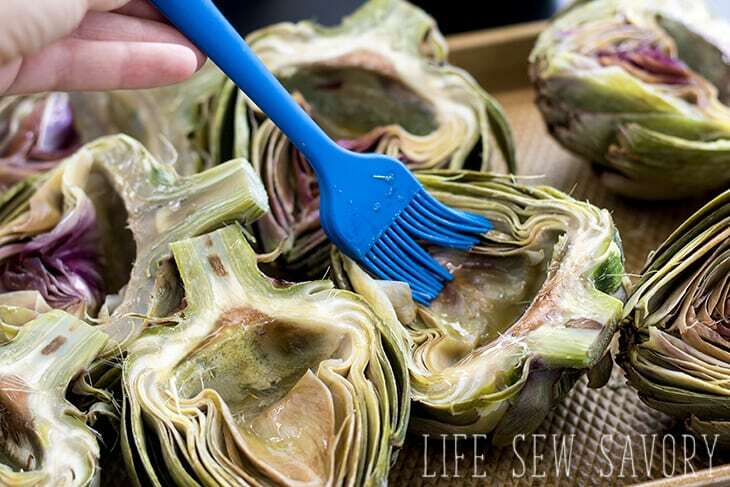 Trim the outer leaves and stem on 4 artichokes. 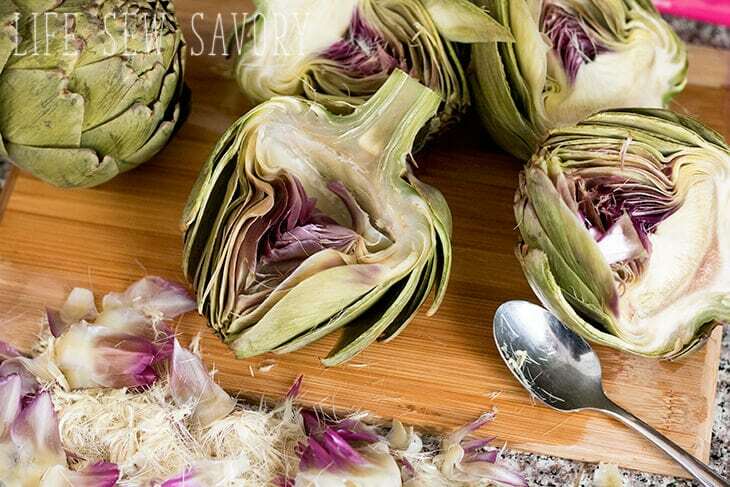 Boil them artichokes in a large pot. Boil for 12 min. Remove from the pot and let cool. When you can touch, slice in half and remove the “fur” and other small inside leaves. Brush with olive oil. Pre-heat the grill to medium heat and then place artichokes on the grill. I placed the outer side on the grill first for about 7-8 min, then flip over to the inner leafy part and grill another 7-8 min. 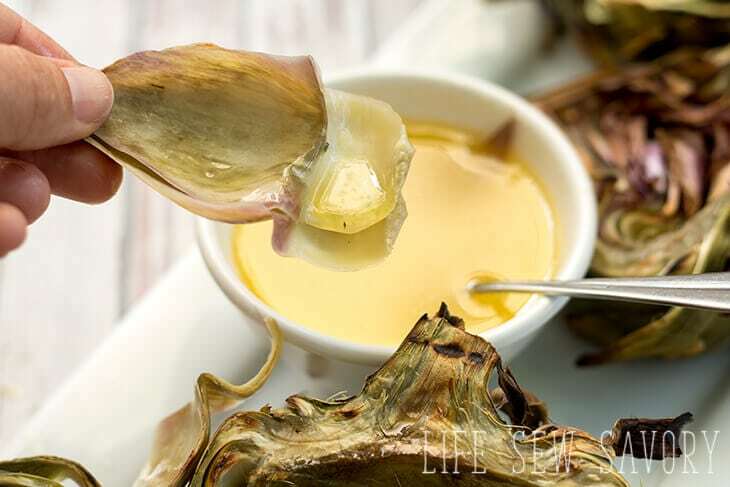 While the artichokes are on the grill prepare the garlic butter. Melt 1/2 stick of butter in the microwave and then add 1 TBS garlic salt for a tasty garlic dipping sauce. Clean 4 artichokes and remove tough outer leaves. Trim stem to 1". Bring water in a large pot to boil and place artichokes in water. Cover and boil for 12 min. Remove from water and let cool. Cut in half and scoop out the "hairy" bits and pokey small leaves. Place on a baking sheet inside up and brush with olive oil. Pre-heat grill to medium heat. 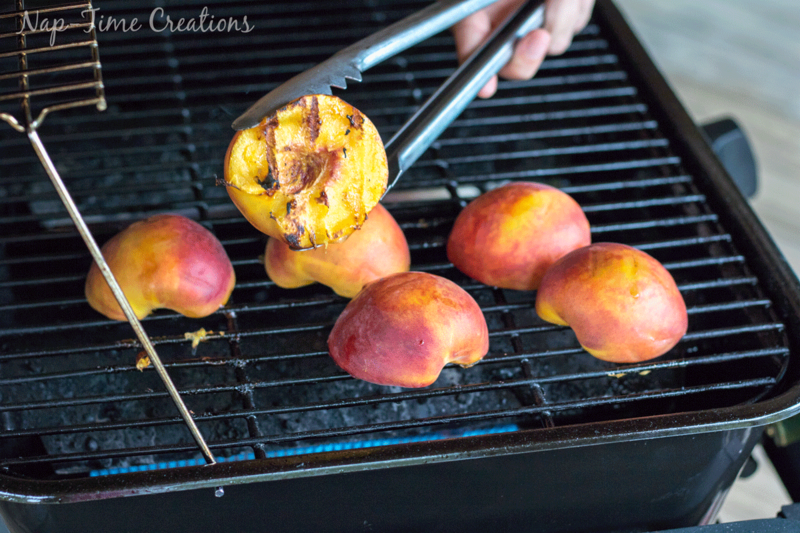 Grill with outer leaves down for 7-8 min and then flip and grill 7-8 min more. While grilling melt 1/2 stick butter and add 1 TBS garlic salt, mix to create garlic butter. 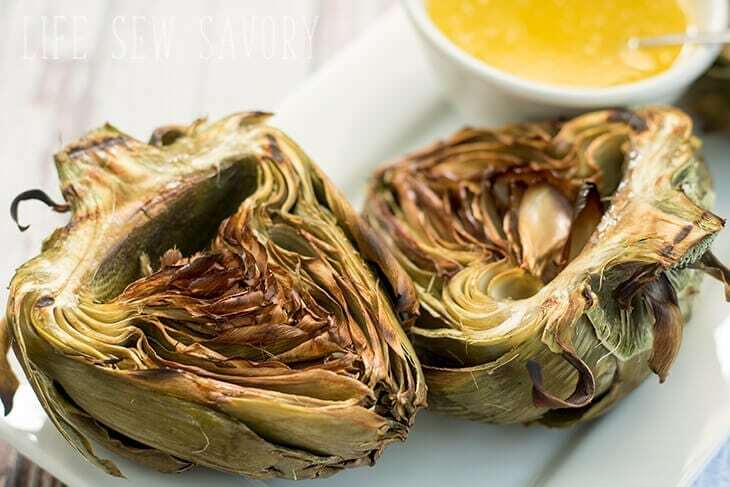 Remove artichokes from grill and serve warm with butter. They are also good room temperature..